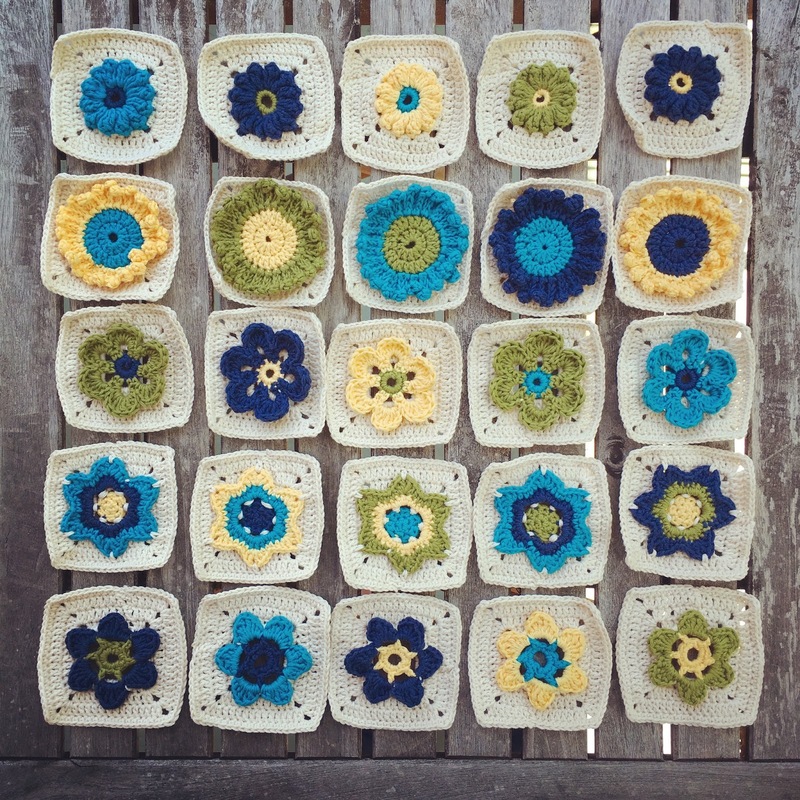 Nine weeks ago I started the Meadow Mystery Blanket CAL because I wanted to reactivate my crochet. Just like knitting I learnt how to crochet at school, so about 30 years ago. I was never any good and neither did I like it very much. Because this happened to be true about knitting and my feelings totally changed I wanted to give crochet another chance. Somehow a CAL seemed like a good idea. I would learn by doing in little steps over the 18 weeks of the CAL and at the end I might know whether crochet was something for me or not. In the beginning I was terribly clumsy and I had to watch the videos over and over. I couldn't remember all the names of the different stitches. It was slow progress but now I can more or less read a pattern (a written pattern) and I had quite some fun with the granny squares we had to knit over the first eight weeks. This week it was time to join them all together, so now they look like a blanket for the first time, a tiny blanket which is supposed to grow more over the second part of the CAL. Knitting is still much more interesting for me but I enjoy learning new techniques and seeing the project grow. So lovely! Crochet is my first craft love, though I don't make many crochet things right now I am always drawn to it. I might try to crochet other projects afterwards, I am sure there are very cool things out tgere to be done. that sounds like such a fun idea for learning to crochet! 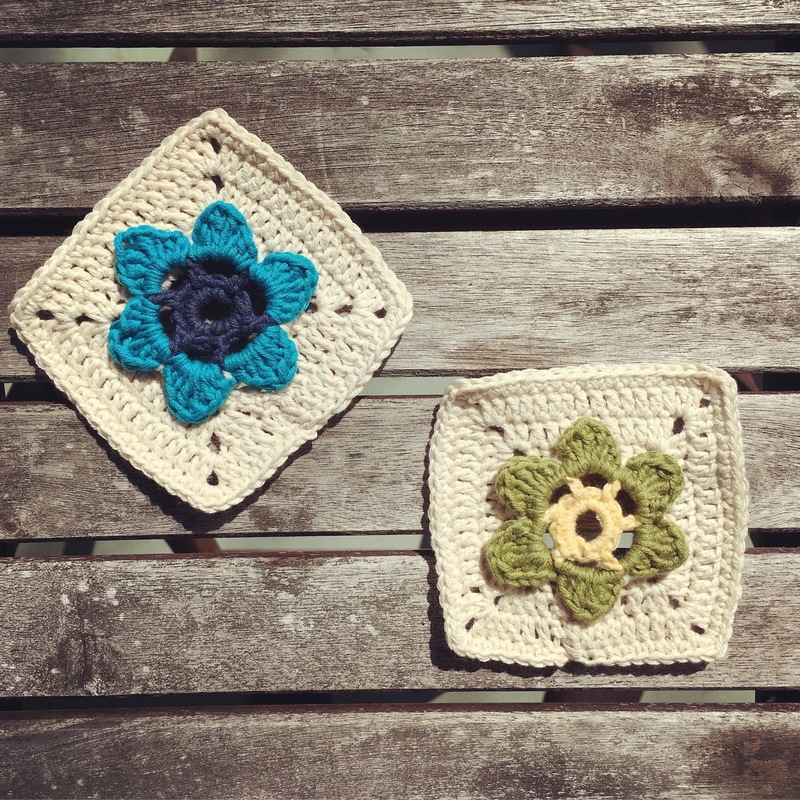 A square each week seems manageable, and to be learning more each time. Your blanket is looking great! It's definitely interesting to see how all the differnt flowers are done. I am always looking forward to the next clue. Then you should totally do this CAL, because it shows you step by step how to do all the different flowers. I was really glad there were videos for every granny square in the beginning and even now I just watch the newest video when I get stuck. love the color scheme and you are a natural :) I love that the flowers look different! thank you Karen. These little flowers make me happy each week.